Some men have lofty dreams! Look at Bob Belcher. He just wanted to run the best darn burger joint in the entire city and its… well, he’s had a few speed bumps here and there. He once got accused of making hamburgers out of human meat. Tina, his daughter, is in love with the son of Jimmy Pesto, his main competition in the area. He once pooped his pants during a fight with Jairo, the local Capoeira instructor. But none of that stops him! Maybe you should try to be a little more like Bob from Bob’s Burgers… starting with this licensed costume t-shirt! 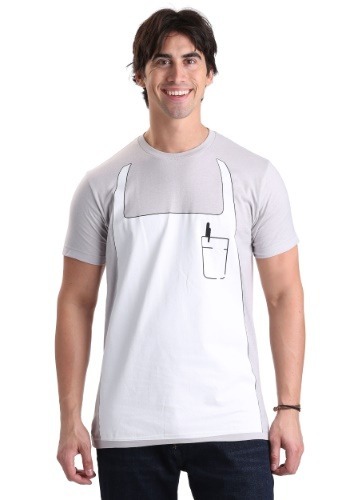 This Bob’s Burgers Apron t-shirt is designed to look like Bob’s apron from the show. It has a printed apron on the front, along with a faux pocket and pen. Once you have it on, you might just find yourself feeling more apt to dealing with life’s troubles… just make sure you don’t miss your 4:30 meeting, or you might regret it!